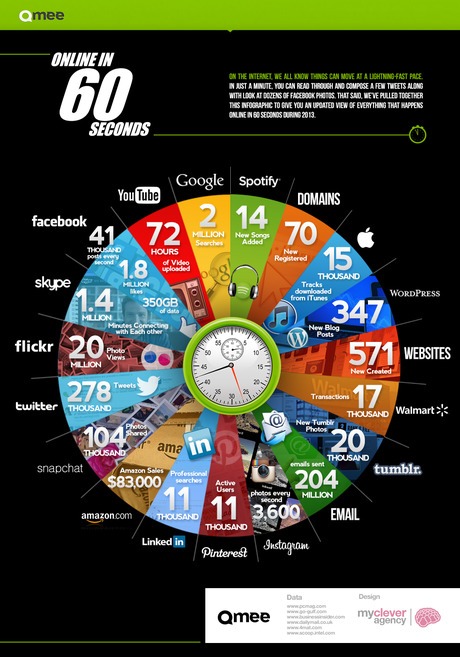 AccuraCast SearchStarz Blog: What Happens on the Internet in Just 1 Minute? If you haven't read the Independent's article on what happens online each minute, then you have missed an extremely interesting article and infographic. You can find the infographic from QMEE below, which outlines key statistics for popular online activities based on data collected during 2013. Amazingly, 72 hours of video are uploaded to YouTube each minute and 14 new songs are added to Spotify every 60 minutes.